Camfield’s Parallel Cam Indexers are ideal for High Speed Application or for actuation type applications. Parallel Cam Indexers use a pair of conjugate plate cams with yoke – mounted followers parallel to the axis of the output. The input and output shafts are parallel, in a combination that means there are no ribs on the Cam and no reversal of the Cam followers. Rates of more than 1000 indexes per minute are possible with parallel Indexers. Due to the Cam and Turret design, extremely small index angles are possible resulting in a longer Dowel period. These units can be used as a modern, accurate replacement for Geneva style mechanism, and are also available as oscillators. Camfield’s Parallel Cam Indexers are ideal for high speed application or for actuation type applications. 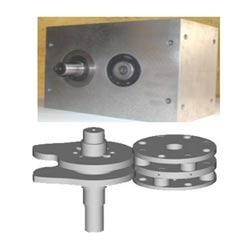 Parallel Cam Indexers use a pair of conjugate plate cams with yoke – mounted followers parallel to the axis of the output. The input and output shafts are parallel, Due to the cam and turret design, extremely small index angles are possible resulting in a longer Dowel period. These units can be used as a modern, accurate replacement for Geneva style mechanism, and are also available as oscillators. Looking for Parallel Cam Indexers PD Series ?